Great as Bruschetta spread or as Dip sauce with Grissini, Salami and Prosciutto. 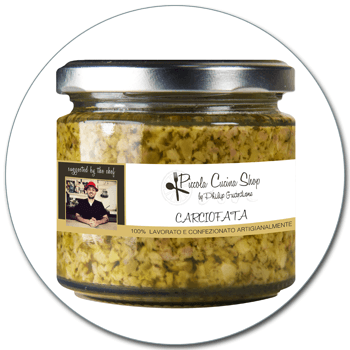 Delicious as Artichoke-Pesto with short pasta such as Penne, Pennette or Maccheroni. Drain the Pasta when it is al dente. Put some olive Oil, Carciofata and the drained pasta into a large frying pan. Sauté rigorously for 2-3 minutes. Important: After opening store in the refigerator and use within 3 days.